The Kelly Brush Foundation is dedicated to making active lifestyles a reality for anyone with a spinal cord injury. Through the Active Fund, they provide grants for individuals with paralysis caused by spinal cord injury to purchase adaptive sports equipment. 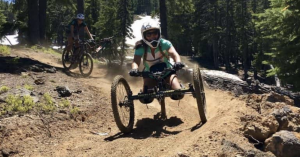 They have helped 600 people from 47 states purchase handcycles, monoskis, sport chairs, racing chairs, hockey sleds, scuba equipment, bowling ramps, equestrian saddles, and much more. You can apply at this link. The application is at the bottom of the page.